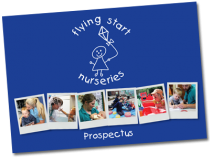 Flying Start Nurseries (S.W.) Ltd is a Private Limited Company registered in England and Wales No 07395530. How Will We Use Information About You & Your Family? We collect information about you and your child/children so that we are able to meet their individual needs, keep them safe from harm and give them a rich environment in which they can learn and thrive. If you agree, we may also contact you about other products and services we think may be of interest to you. We sometimes use information collected from the website to personalise your repeat visits to our website. Flying Start Nurseries (S.W.) Ltd will not share your information with other companies unless required to do so to provide services you have requested, or where required to do so by our regulating bodies. This may be to keep a child safe from harm or to access essential professional services. There may be occasions when we will need to pass your details to professional agencies, such as a bank for payments, funding bodies, safeguarding authorities, Ofsted, legal or a debt collection provider. We would like to send you information about our products/services, and information and training materials that may be of interest to you. If you have consented to receive marketing messages you may opt out at any time. You have the right at any time to stop us from contacting you for marketing purposes and if you no longer wish to be contacted for marketing purposes, please contact us using the details below. You have the right to request a copy of the information we hold about you. If you would like a copy of some, or all, of your personal information please email or write to us using the contact details below. We want to make sure your personal information is accurate and up to date. You may ask us to correct or remove information that you think is inaccurate.